Dr Karl introduces himself immediately on opening the book, answering a questionnaire beneath a ‘Who Am I’ banner. He then invites the reader to fill in details about themselves in a similar questionnaire. This feels like inviting someone into a warm space to sit in your favourite chair. 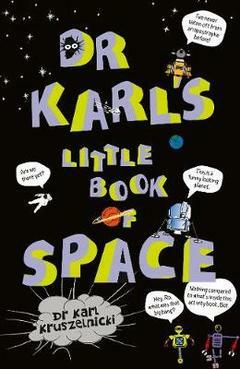 Dr Karl’s brilliant mind shares facts about the Solar System, explains why stars twinkle, and how to count them (if it’s possible). He challenges the reader to write poems at intervals using his list of easy words to use, and gives hints on how to design and make your own rocket. The entire book is full of activities and quizzes designed to excite and teach children about astronomy in a fun, relaxing manner. There is a find-the-difference in two space shuttle pictures. The origin of Luna is presented in a humorous way with crazy drawings. Light-hearted entertainment is how to aptly describe the contents of this book. This is easy learning science for kids at its best. Answers are found at the back of the book, but children are trusted to try their best before checking whether they have the right answers or not. 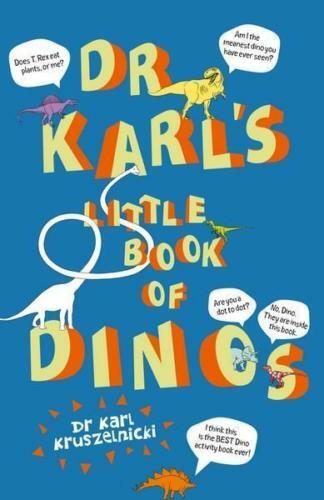 Dr Karl’s Little Book of Dinos is released simultaneously with the Little Book of Space. The layout of both books is identical in every way, and they are true gems for children who have an interest in either or both subjects. They hold countless hours of absorbing occupation, are a terrific concept, and great learning tools no matter how you look at them.